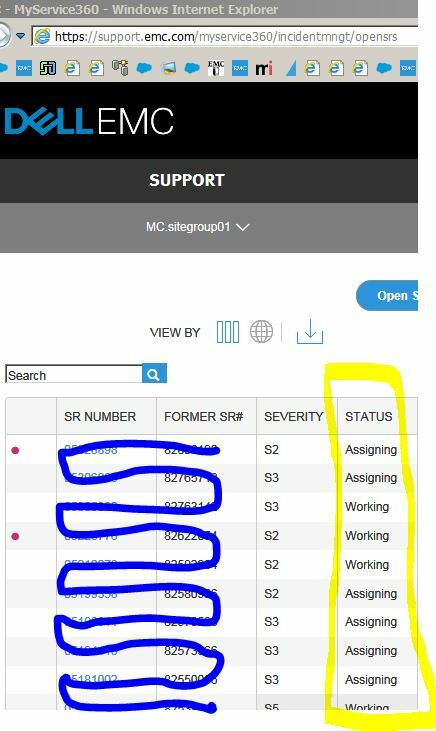 i always do this by just seeing site id all sr request status, including all wich has status "CANCELLED"
My sincere apologies for the delayed response to your post, and to your Online Support account access request. I just checked your service request, and I see that you are working with one of our eServices Customer Support Technicians, but based on your latest response back to us yesterday it appears you're still experiencing password issues. I will follow up with our eServices support team and get back to you offline. Thanks for your patience as we work through this issue. We appreciate your new business with Dell EMC. thanks a lot for your repsonse, yesterday the eServices Customer Support solved also the problem related to the password. Now I can access to "Service Request" and "Live Chat" services but unfortunately I'm facing another kind of problem. I still can't submit Service Requests or start Live Chats because the system ask me to specify a product or a site for the request but no sites are available for my contact nor products. I replied to the support explaining what happens exaclty attaching screenshot for every issue. I'm waiting a reply. Anyway from licensing portal I can see our ScaleIO license registered and active but from Service Portal there is no way to select this product. I think that there is still some issue. I think that eServices Customer Support will solve this issue in the near future. I heard from our eServices Support team that your issue has been resolved. Please let me know otherwise. Thanks again for your patience as we worked through this issue. Thank you everyone for your questions and feedback during this Ask-the-Expert event! Since the release in September, our teams have been working to address your concerns and provide you with the best possible service and support experience. We encourage you to read the latest Support Blog post: MyService360: Latest Enhancements & Quick Tips highlighting some of the most recent enhancements.